CRISM's design came about as the combination of several innovative technical solutions to some very demanding and sometimes conflicting needs by an instrument like CRISM. Challenge #1: Conflicting resolution and signal-to-noise ratio requirements. CRISM simultaneously needs high spectral resolution, high spatial resolution, and a high signal-to-noise ratio. Signal-to-noise ratio is a measure of precision of the measurements. High resolution means dividing up the collected photons of light into small spatial and spectral bins, whereas a high signal-to-noise ratio requires measurement of as many photons of light as possible. Solution: A gimbaled sensor system. Reconciling the conflicting demands requires some type of active pointing so that a target can be tracked and long exposure times can be used to collect as many photons as possible without smearing the images. This could be done using a scan mirror or by gimbaling the entire sensor system. CRISM uses the gimbaling approach, because it accommodates an ample telescope baffle to keep stray light to a minimum. CRISM's gimbal uses sophisticated software control that tracks a target on the surface. Simultaneously, the field of view is scanned across the target to build up a hyperspectral image. CRISM's gimbal motor and position encoder keep the field-of-view on a pre-programmed angular profile to track a target on the Martian surface. 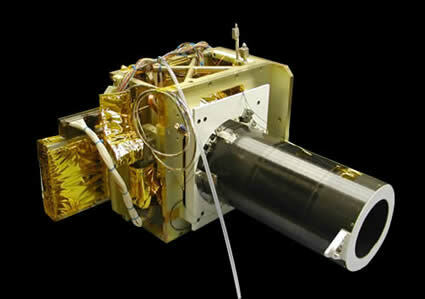 Challenge #2: Cool the IR detector without impacting spacecraft operations. 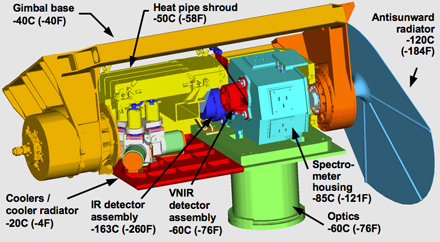 The detector that measures the 1-3.92 micron part of CRISM's wavelength range needs to operate at a very low temperature, colder than -148.15°C (-234.67°F). There are two ways to get the detector this cold, passively or actively. In passive cooling, the detector would be connected to a radiator that points to cold, deep space and radiates away the detector's heat. However, MRO needs to point to a variety of locations on Mars, and it would be nearly impossible to keep Mars out of the radiator's view. If the radiator looked at even a part of Mars' day side with any regularity, it couldn't get the detector cold enough. The other approach is to use a mechanical cooler, a cryogenic refrigerator. 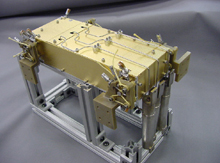 As CRISM was designed and built, two kinds of mechanical coolers were available: small ones that may not have enough lifetime to last through MRO's mission, or a long-life cooler that would be too massive to fit in CRISM. Solution: Three small coolers, multiplexed to the detector so that any one at a time can operate. 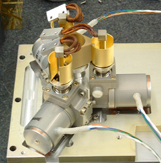 No existing cryogenic system met CRISM's requirements, so the team worked with Swales Aerospace to invent one. Three small coolers were ganged together so that if one failed, it had two backups. The three coolers not only met, but exceeded MRO's operational lifetime requirements. Any one of the three provides enough cooling capacity to get the IR detector below its temperature goal. After more than 6 years of observing Mars, 2 of the 3 coolers remain functional and able to get the IR detector cold enough to take useful data. Ganged coolers (left) and an assembly of cryogenic diode heat pipes inside a protective shroud (right) provide a technical solution to CRISM's otherwise conflicting requirements for cooling its IR detector. 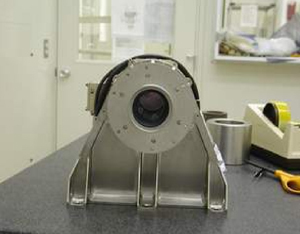 Challenge #3: Keep the IR detector and spectrometer cold, while keeping other parts of the instrument warm. CRISM’s sensor is only the size of a small microwave oven, yet within that small space different components need to be kept at temperatures that differ by as much as 150°C (255°F). All this has to be accomplished using no more than a few watts of power. This is like saying, "keep a pot of water boiling and an ice cube frozen on a dinner plate, while keeping the plate at room temperature. And use no more electricity than a Christmas tree bulb." Solution: Different zones of the instrument naturally radiate away heat at different rates. Most spacecraft instruments are covered in special blanketing to keep them warm. Instead, CRISM is hanging out exposed and cold. In fact, it's covered with special white paint to make it even colder. Two radiators face Mars and naturally keep the coolers and telescope at their separate, optimal temperatures. The coolers' operation provides just enough heat to keep them warmer than the telescope. Just a few watts of power are needed to cool the IR detector. This cut-away view of the OSU shows the different thermal zones inside it. Challenge #4: Maintain accurate calibration of the instrument across a wide range of operating temperatures and conditions. Spacecraft optical instruments and their detectors are notoriously difficult to maintain accurately calibrated, as they get exposed to different temperature conditions and accumulate radiation exposure in space. Solution: Onboard calibration sources allow the effects of radiation and temperature to be measured and divided out of the data. A special 3-position shutter is key to this approach. In the "open" shutter position, CRISM sees Mars. In its "closed" position the shutter blocks the field of view, so that the IR background glow and other similar effects can be measured. In a third position, the shutter provides a view into a small "integrating sphere." This is a sphere with an opening to see the inside, which contains a small incandescent light bulb. 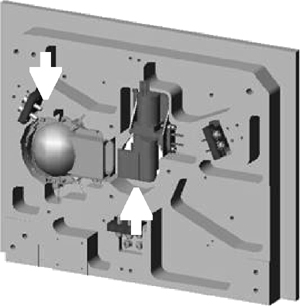 This computer rendering shows the rigid plate to which CRISM's telescope and spectrometer are mounted. The integrating sphere and shutter are indicated by the upper left and lower right arrows. Challenge #5: Use CRISM as a color camera to fill the gaps between targeted observations. Targeted observations exercise the full capabilities of CRISM, yielding 544-color, 18 meter (60 feet) per pixel images. But targeted observations take so much data volume (about 200 megabytes a piece) that only about 1% of Mars can be imaged in this way. Solution: Electronic switching allows CRISM to select a lower resolution operating mode and any subset of wavelengths. CRISM has several reduced resolution modes capable of mapping Mars at 100 or 200 meters per pixel, and any combination of wavelengths can be selected by command. Different modes use as few as 72 wavelengths – through early 2013 82% of Mars has been mapped in this mode – or as many as 262 wavelengths.